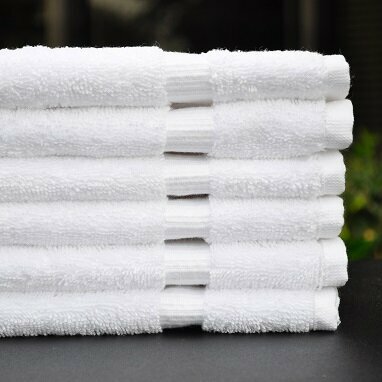 Premium grade Extra soft white hand towels 16x30(3.8Lb) heavy quality for use in Salons, Gyms, Spas, Hotels and many more businesses. Does it ever seem like you’re always running out of durable, reliable hand towels at home? You might just need to find better quality products that will give you the peace of mind you and your family deserve. Towel Super Center offers a wealth of towel solutions, including 16” by 30” premium hand towels at wholesale prices. You don’t have to be a commercial business to get a deep discount. Plus, you’ll always have the benefit of enough towels in your linen closet. Place an order from any device today and experience the luxury and dependability of premium cotton towels. Where do homeowners like to place these premium hand towels? Check out these possibilities. Bathrooms: From master bathrooms to powder rooms, wholesale hand towels encourage everyone to practice good hygiene. Be sure to have enough hand towels in each bathroom, along with a towel bar or drying ring to encourage cotton’s natural ability to dry rapidly. Pool Areas: Have a pool area or a spa in your backyard or side yard? Hand towels can make it easier to dry off your arms and hands when you don’t need a full-sized bath towel. For instance, have you ever simply wanted to answer a ringing cell phone, but intend to get back into the water? Why waste a big towel when smaller hand towels are available? Garages and Basements: Plenty of people play the role of "tinkerers" in their homes. Therefore, they regularly need to clean off their hands. Rather than supply them with scratchy, non-absorbent rags made of an unsuitable material, give them fluffy cotton hand towels to get the job done right — and comfortably! Mudrooms and Closets: We’ve all had the experience of coming in from outdoors after a sudden rainstorm or snowfall. Why track mud and wetness through living areas? Having towels near entrances and exits makes it simpler for people to clean off without making messes in other rooms. Kitchens: Although your kitchen likely has some towels specific to the kitchen needs, you can also consider outfitting the kitchen with premium cotton hand towels. After all, you or someone else could easily need to use the kitchen sink to wash your hands in addition to cooking preparation or clean-up. Wondering how best to keep your wholesale cotton hand towels looking pristine for as long as possible? Although cotton fibers naturally resist stains and odors, you can keep them even cleaner with a little TLC. First, be sure to pre-treat any significant marks before laundering. Pre-treatment products abound, so find one that you feel good about. That way, if you can’t wash your hand towels immediately, they’ll be less likely to get discolored or marred. When you do a load of laundry, give your towels enough room to agitate during the washing and rinsing cycles. The more room they have, the easier it is for the cotton to let go of dirt and debris. If you’re concerned about the towels’ fluffiness, you may want to add a bit of liquid fabric softener, although this can leave a residue that hampers absorbency. In the dryer, add a dryer sheet to combat static cling and provide a fresh scent. Cotton is relatively fast-drying compared to other materials, so expect to spend less time drying your cotton towels than other towels. Be sure to fold and store them or display them immediately. Ready to get the value of premium cotton towels? Order today from Towel Super Center!